We’ll admit that keeping tiny toes busy during the school holidays can be a difficult task however HMV have you covered with Peter Rabbit on DVD for only £12.99. With a star studded line up including James Corden, Margot Robbie and Daisy Ridley. Based on Beatrix Potter’s characters, the story focuses on mischievous Peter Rabbit stealing vegetables from Mr. McGregor’s garden and allows you to steal some quiet time with the kids! If you’ve not found time to schedule in a summer holiday, look no further. Lush’s Big Blue Bath Bomb costs just £3.50 and evokes a summer’s day at the seaside that’s perfect for drifting off. The key ingredient of arame seaweed softens in your bath water, which helps to regulate metabolism whilst the release of sea salt softens the skin and helps to remove dead skin cells. If you can’t get to the sea, why not bring the sea to you? 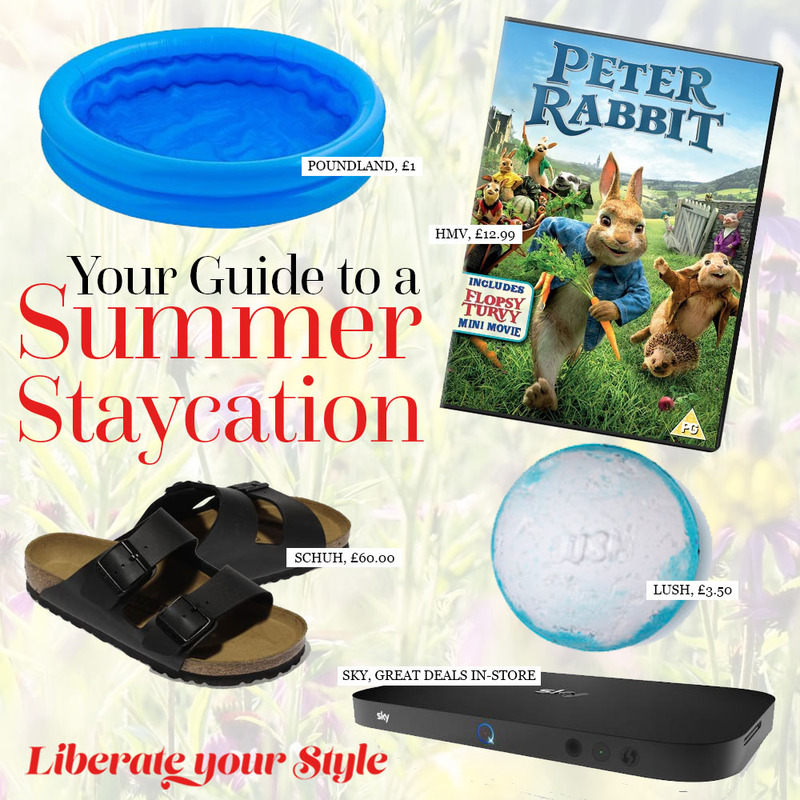 Whether you’re taking your seat to watch the latest seasons or indulging in the newly releases movies, why not treat the family to Sky this summer? Not only will it keep the kids occupied, but you’ll also score goals with the football lovers! Just because you’re not heading abroad doesn’t mean you can’t update your summer wardrobe. With the infamous partnership of comfort and timeless style, Birkenstock’s Arizona sandals give you the confidence to step out into summer as a real fashionista. At £60 from Schuh, the Black Birkenstocks are a wardrobe go-to that can be taken from day to night by any beach babe. Make memories over the holidays with Poundland’s Mini Paddling Pool at a steal price of just £1 this summer. Perfect to splash around in and cool down, the mini pool fits easily into the garden and makes for hours of endless fun! If you’re looking to bring the kids along for free, fun activities, why not pop down to The Liberty and take part in our celebrations? There’s everything from jungle parties to resistance sliding! For more information about our events, visit our website or head to our Facebook, Twitter, or Instagram.